NAD has an enviable reputation for creating great sounding products at very affordable prices and nowhere is this more evident than in NAD’s CD Players. The NAD C 538 Compact Disc Player includes many desirable features that enhance listening pleasure. The C 546BEE lives up to its predecessor’s reputation, by delivering a performance that is both refined and riveting. 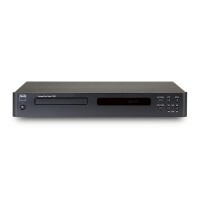 Supporting a wide range of program material such as CD, CD-R and CD-RW, the C 546BEE will seamlessly play discs that are encoded in both MP3 and WMA.